We have another Ultimate NHL Playoff debutant and it will be the ’15-’16 Winnipeg Jets. First off, here is the full qualifying tournament results. 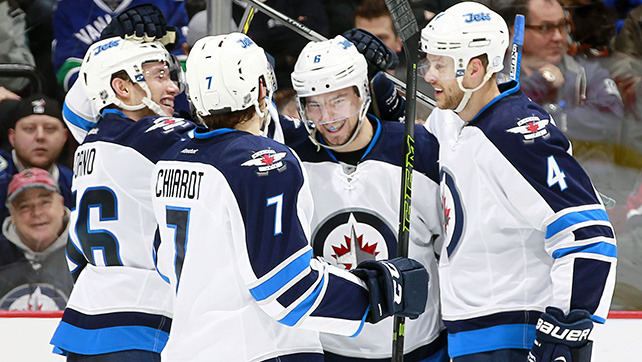 The ’15-’16 Jets started off the series with a 4-2 win before dropping the next two games. Defenseman Toby Enstrom assisted on three of their four goals in that first game. The ’11-’12 Winnipeg Jets responded with a 4-1 win in Game 2, led by goaltender Ondrej Pavelec, who stopped 52 of 53 shots against. Evander Kane chipped in with two goals in the victory. Kane then posted a goal and an assist, along with Blake Wheeler as the ’11-’12 Jets took Game 3 by a score of 4-3. However, that would be their last win of the series. Game 4 was tied 2-2 after two periods, but the ’15-’16 Jets rallied off five goals in the third period from five different players to tie the series at two with a 7-4 win. Youngsters Jacob Trouba and Nikolaj Ehlers led the way in the win with a goal and two assists for each of them. Then, in Game 5, Pavelec stopped 38 of 39 for the ’15-’16 Jets as they won 3-1 as Chris Thorburn‘s two points led offensively. In Game 6, Wheeler gave the ’11-’12 Jets a 1-0 lead late in the first, but Ehlers tied it early in the second for the ’15-’16 Jets. The next goal came from Alexander Burmistrov at the 2:38 mark of the second overtime as the ’15-’16 Jets clinched the qualifying tournament victory. The ’15-’16 Jets are the second team so far to qualify for their first UNP appearance. Up next is the Colorado Rockies Qualifying Tournament! This entry was posted in Qualifying Tournament, Ultimate NHL Playoff and tagged Alexander Burmistrov, Andrew Ladd, Blake Wheeler, Bryan Little, Chris Thorburn, Dustin Byfuglien, Evander Kane, Jacob Trouba, Mark Scheifele, Nikolaj Ehlers, Ondrej Pavelec, Qualifying Tournament, Toby Enstrom, Ultimate NHL Playoff, Winnipeg Jets. Bookmark the permalink.